Building an Intel 8008 Computer "Clock"
About every year I design and build a new clock. This year’s project is a clock based on an Intel 8008 first generation 8 bit microprocessor. Because it is a fairly unique project I’m putting more effort into the documentation. I’m also totally opening the design, hardware and software, to anyone wanting to learn more about the 8008. The only requirement I have is this: if you copy or reproduce my information please give me the credit. I spent a good amount of time and effort designing and building the 8008 clock prototype. I’ve also tried to do this when I’ve used other's information. If you see something on my site where proper credit has not been given, let me know. I have also created I8008DesignClub at Yahoo Groups for anyone interested in joining a community of 8008 users. When designing the 8008 clock it would have been nice to ask a few questions. Unfortunately, I didn’t have anyone to ask; so I did this all solo. I’m sure there are better ways to have done things. In any case it will be interesting to see how many 8008 fans still exist. Please note that I have done my best to ensure the accuracy of the schematics and PLD algorithms. Each time I made design changes I did so by updating the schematics first and then the actual prototype. Even at that there could be errors. I make no guarantees or warranty that building your own 8008 clock will work. I can only tell you that mine works. If you are fairly experienced and are careful you should be fine. I apologize if I wax philosophical too often on this page. Building this clock brought back many memories that occurred over thirty years ago. I was lucky to be a teen in the 70’s during the birth of the micro-computer chip. During that period one could not drive down to a store and purchase a home computer as one can today. The computers of that era were university main frames and mini’s, like the PDP11’s, used by Corporations. My first access to a computer began while I was in junior high school. I discovered that I could buy time on the University of Utah’s Univac 1108 for one dollar per hour! Unfortunately, non-university students were only allowed to buy a maximum of ten hours per month. So I plunked down my money and with punch card in hand made my way over to a model 43 teletype and thus began one of the most interesting journeys of my life. At about the same time, articles began to appear in electronic magazines that told of single chip CPU-based computers. I read in fascination about the Intel 8008 microprocessor. As soon as I could get the address on an envelope I sent a letter to Intel asking for a copy the 8008 user’s manual. I spent hundreds of hours reading and digesting every page of that short document. The Mark 8 edition of Radio Electronics became one of my most treasured possessions. I read and reread every page. I fantasized about being able to afford a board set, and about building a Mark 8. But rather than building a Mark 8, I ended up, designing and building an 8008 computer of my own design, over a three year period. In reality, I probably spent twice what a Mark 8 would have cost. But the educational value of that endeavor was priceless. Years later, in the late 1990’s, I was fortunate enough to exchange email with Jon Titus, the designer of the Mark 8. I had long since lost my original copy of Radio Electronics that contained the Mark 8 plans. Jon was kind enough to mail me a copy of the article and at the time I also discovered that Jon would be traveling to Salt Lake City. While he was in Salt Lake, we met for lunch. Meeting Jon was a truly magical moment. I’m not sure if he remembers me, but I will always remember him. Thank you, Jon! My original 8008 computer utilized nearly one hundred TTL logic chips. The 16k of memory was comprised of one hundred and twenty eight 2102 static rams. I spent hundreds of hours meticulously wire wrapping the processor and IO boards, as well as the back plane. The 16k of 2102 memory chips found their home on four commercial 4k S100 logic boards. For input I used a South West Technical Products ASCII keyboard. For video output I built a text display from a kit sold by Mini Micro Mart. It alone had over 50 IC’s. Its design used the same shift register chip set as the Apple I. Even though I had a keyboard and a video display, the real input and output mostly occurred on the front panel using toggle switches and LEDS. Long before I completed designing and wire wrapping my computer I had hand assembled many lines of code in anticipation of the day when I could actually run the code on my own computer, although in the end, much of that code never was entered. Loading software via the front panel switches was frustratingly laborious! I did however validate that the computer worked. I loaded a monitor that would read keystrokes from the keyboard and display them on a video monitor. That event was the culmination of three years’ work and proved to be very satisfying. The motivation to design and build a clock based on the 8008 came from many sources. For several years I’ve been designing and building unique clocks. So far, all of them have been built around modern day micro-controller technology while using obsolete display technologies. Using the 8008 offered huge doses of nostalgia. It also turned out to be challenging! Unlike microprocessors today, the 8008 appears almost analog when looking at the slop of the signals emitted by the 8008. To build a computer around an 8008 you have to use a lot of external logic. You also need to compensate for things that just don’t work as cleanly as you’d expect. Looking back today I’m actually quite impressed that my original computer ran. In the 70’s I was working on a shoestring budget. My test bench consisted of a “cheap” low bandwidth single trace oscilloscope and LED’s. I didn’t even have the ability to see the delay from clock to sync output, as I do now, not to mention the usefulness of a logic analyzer in understanding the 8008. Be aware that I cheated this time around, at least I feel that way. In this design I use many modernly available shortcuts such as programmable logic devices and a high density ram. These devices were not available back in the 70’s. In doing so I do not believe I compromised my goal. My goal was to build a clock, not become crippled and blind, wire-wrapping two hundred IC’s. Unlike my teenage years, I don’t have unlimited time, and I now have a mortgage… I no longer mow lawns for a living, as I did at fourteen. Please understand this is a fully operational 8008 computer. Its 16k of memory space can be configured to use several combinations or RAM and EPROM. I designed in four input and four output ports. It also has a fully functional front panel that can be used to examine or modify memory, or jam in an interrupt instruction. If you are a purest, feel free to convert the PLD algorithms to random logic to build a more authentic computer, though doing so may require modifications to compensate for timing delays. Also remember you cannot load the 8008 down with more than one TTL load. You must buffer all signal lines coming from the CPU. You should also keep in mind that adding more logic chips will increase the power requirements. The five hundred kilohertz two phase clock required by the 8008 is derived by dividing a two megahertz crystal oscillator by four using two flip flops. Two AND gates then combine the 1 MHZ signal from the first divider stage and the outputs from the final divider stage to produce a two phase non-overlapping clock. Please note that this clock produces a non-compliant signal. Since I AND the signal from the first stage, the system clock produces signals that are shorter than those specified in the Intel spec for the 8008. Each phase is only 500 nanoseconds wide. The Intel 8008 manual specifies a pulse width of 700 nanoseconds for phase one and 550 ns for phase two. If you happen to have an 8008-1 you can substitute a 3.2 Megahertz oscillator to end up with an 800 kilohertz clock. The spec on the 8008-1 calls for a 350 nanosecond pulse on both phases of the clock. Again the clock circuit would produce a shorter pulse of around 313 ns per phase. Control signals for the 8008 computer are generated using a 22V10 GAL. State lines S0, S1, and S2, the sync line, as well as the high order address bits D6 and D7 are combined to produce bus, memory, and IO control signals. When the computer is in a stopped state the addressed memory location is displayed on the front panel. During the stopped state control signals from the front panel are fed into the 22V10 that allow addressing random memory locations as well as writing to them. The 22V10 also produces signals for interrupt processing. Using the PLD really cuts down the chip count and also the power requirements. A 74LS245 is used to buffer all data coming to and from the 8008 CPU. When the 8008 is not outputting data the ‘245 is configured to point data to the CPU. This essentially floats the main data bus. All devices only talk when they are addressed and the respective control signal is enabled. When the processor is in a stopped state the memory read signal (MER) is lowered by default to allow the viewing of memory data on the front panel. Many of the original 8008 designs used multiplexer chips rather than a common data bus. I voted for simplicity by having one common bus. I use two 74LS273’s to latch the address lines. This is done during the T1, T1I, and T2 system cycles. The high address latch contains two bits, D6 and D7, that are routed back and decoded by the 22V10. These bits are used to determine memory read, write and IO cycles. I opted to use latches, but one could also use four 74LS193’s or equivalent. If you plan to load lots of program data by hand using the front panel, using the counter/latches makes the job much easier. You can simply latch in the starting address and then increment or decrement the address counters/latch to the next address and then load the data. This way you only need to set the data switches, deposit the value, increment to the next address, and repeat the process. The other option would to be to modify the front panel to interface with a printer port. A fairly simple program would let one upload software to the 8008’s memory from a PC. Interrupt logic for my 8008 computer allows you to jam a single instruction into the CPU from the front panel switches. When the interrupt switch is pressed, a signal toggles a 74LS76 flip flop. Next the output of the flip flop routes to a 74LS74 flip flop that is synchronized with the phase one clock of the CPU. This forces the rising edge of the interrupt to be synchronized for correct CPU operation. Once the CPU recognizes the interrupt request, it outputs a T1I state, which is then latched by another 74LS76 flip flop to create the “PINT” state. (Process Interrupt). When the PINT state is active the next instruction fetched will come from the front panel. The PINT state is then cleared by the /MER signal. The extra random logic is used to clean up a few glitches inherent in the 8008. Because the 8008 starts up in a stopped state an interrupt is required to get the computer running. The 8008 is capable of addressing a maximum of 16k bytes of memory. The system includes both RAM and ROM. Using the configuration switches you can select 0k, 2k, 4k, or 8k of ROM, the remainder becomes addressed as RAM. 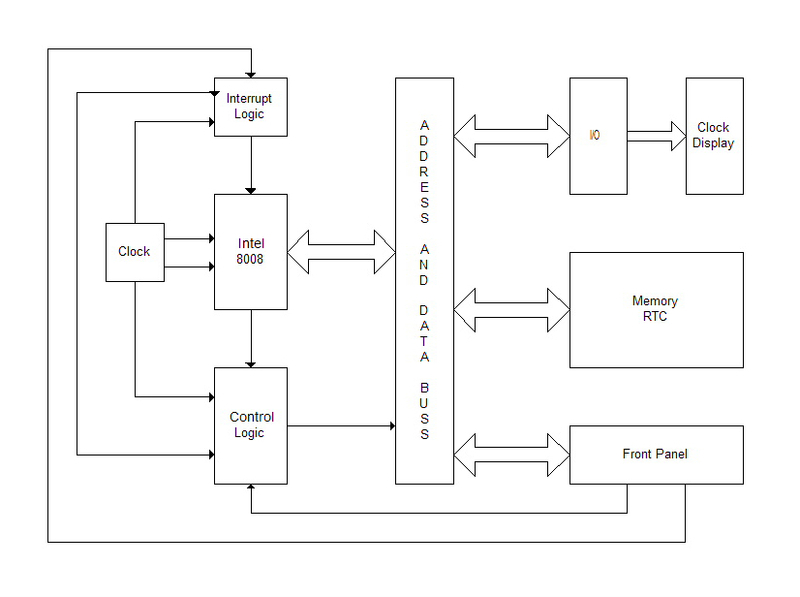 A 16V8 GAL chip provides decoding for the memory as well as the mapping of the RTC if enabled. I used a 2764, 8k by 8 bit, EPROM for program space. When I am developing programs I use the “crash and burn” method. That is, write the program, burn it to EPROM, give it a try, and if it crashes I do it all over. Rather that using the 2764 EPROM you could swap it out for a FLASH chip of the same size. You’d still need to program the FLASH chip but you’d be ahead with the reduced erasure time. The RAM chip is a Hitachi HM62256, 32k by 8 bit, static RAM. It actually contains twice as much memory as the 8008 can address, so I only use half. Compared to what I used for memory in my original computer, 2102’s that were 1k by 1 bit, the 32k Hitachi chip is amazing. If you again compare this chip to what’s available today in modern computers it makes you want to laugh, or cry. The simplicity that a single memory chip adds is fantastic; it would have been unthinkable in the 1970’s. A National Semiconductor NS32FX211 RTC is mapped into the top 16 bytes of memory. This chip is obsolete and difficult to find. I have several that were manufactures’ samples. The internal oscillator uses a 32.768khz crystal. The main disadvantage of this chip is that there is no provision for battery backup without using external components. To use a different RTC chip would be reasonably simple. Most of the newer chips I looked at used 32 internal registers, twice as many as the NS32FX211 16 registers. To address more registers does not require a logic change to the 16V8 PLD. To do so you would simply tie the A4 address line to the RTC chip. Then tie the input on pin 13 of the triple input AND gate high, doing so you will map the RTC to the top 32 bytes of memory. You will also have to rewrite the sample code for the clock to utilize the different RTC. The 8008 I/O is kind of “funky” by today’s standards. Interestingly enough, the output data is sent during the T1 cycle of the CPU to the lower address latch. The address of the port is then latched during the T2 cycle in the high address latch. During the T3 cycle, the 22V10 used the D6/D7 bits to decode the IO operation and further latches the data to the correct IO port latch. If an input port was addressed, the input data is read from one of the input buffers during the T3 cycle. The upper address byte is also used to decode which input port is being read. I/O port address decoding is done using a 16V8 GAL. The logic is designed to select the first four input and output ports, as designated by the 8008 instructions. If you need a different range, or more I/O ports, you need to make the necessary changes to the 16V8 logic, or add an additional 16V8. The 8008 is capable of addressing a maximum of eight input ports and twenty four output ports. Full traditional front panel functionality exists in my design. LED’s display the address and data bus activity while the computer is running. When the computer is in a stopped state, the contents of the select memory location is displayed. Four momentary switches are used to route the contents of the data switches on the front panel to the low address latch, the high address latch, the selected memory location, or the 8008 data bus during an interrupt request. A 16V8 GAL provides the necessary glue logic to make it all work. In addition, a 74LS123 is used to generate bus and write pulses. There is also an LED that is lit when the computer is running. In the early days a front panel just seemed so natural. Lots of flashing lights and switches to flip made it so interesting. It was a huge paradigm jump for me when computers started coming without front panels. When designing this computer I knew it had to have a front panel. Even with all of the core control signals in PLD’s, putting a front panel on the computer makes it feel right; there must be light. The display is not necessary if you are not interested in building a stand alone clock. The six 74LS47 LED display drivers are connected using limiting resistors to the seven segment displays. The drivers are connected to output ports 0,1, and 2. The clock software combines the four bit digit codes into one byte for the writes. The display is the simplest part of the entire clock. I’ve toyed around with the possibility of using nixie tubes. But in the 70’s seven segment LED displays were well in use. Built and configured as shown here, a suitable power supply needs to provide 5 volts at approximately 1.25 Amps. The 8008 also requires 9 volts at 100 ma when running. To be on the safe side,exceed these values by 50 to 100%. These current draws are based on a computer built using LS TTL chips. Make sure you provide your computer with a well regulated and filtered power supply. I am currently using linear regulators. If you use a switching power supply, verify that the outputs are clean from all switching noise. Also be aware that you need to use a liberal number of bypass capacitors; TTL is very noisy. Bypass capacitors are not drawn into any of the schematics. I use one .1 uf 25 volt disc capacitor for about every two IC’s. Place bypass caps near the VCC connections on the chips, keep the leads short between VCC and ground. Before powering up your computer verify that all power connections and polarities are correct. Not doing so will ruin your day, especially if you destroy a hard to obtain IC, like the 8008. Measure twice, cut once. Here is the logic for all of the PLD’s. I use WinCUPL, free from Atmel, to compile the logic. And a universal programmer built by Logical Devices to program the GAL’s. Nearly all of the parts for the computer can be sourced from Jameco, Digikey, Mouser. The PLD’s are Lattice 22V10D’s and 16V8D’s. One word on where to buy the 8008 chips: Ebay. At any given time there are usually several 8008’s listed for auction. Ebay hint, don’t bid early, doing so only raises the prices. Track the chip until just before the closing of the auction and then bid. Over the years I have collected 8008’s whenever I have found them. The purple ceramic and gold chips can be found for about forty to sixty dollars, the all black ceramic chips for about twenty dollars less. So far I’ve been lucky; all of my processors work. Be careful when handling the 8008 chips, they are static sensitive. TTL is fairly forgiving, but still use good practices; it’s a good habit to form. When running, the processor gets HOT! It runs just over 90 degrees Fahrenheit. All other chips should be relatively cool to the touch, but in reality do generate heat and need ventilation. Keep this in mind if you put your computer in an enclosure. All resistors are ¼ watt. Bypass caps are disc ceramic .1uf at 25 volts. The caps used on the front panel pulse generation are also disc ceramic. The caps used in the crystal circuit of the RTC should be higher quality, I use silver mica. I’ve scanned one of my original 8008 user manuals. I’m also including others I’ve found around the internet. My manual published in 1974 lists the newer type instructions. There are two sets of instructions published for the 8008. The pdf below came from data originating from home.germany.net/nils.eilers/8008/. The next two files are Excel spreadsheets that contain each instruction and their hexadecimal equivalent. So far, the software written for the project has been extremely simple. Its main purpose was to verify correct operation of the hardware. The code here simply initializes the RTC and then goes into a loop reading the RTC’s data change flag. If a change occurs, the time is read and then written to the output ports connected to the display. To set the time I toggle in the correct values into the RTC’s registers mapped in high memory and then interrupt the computer with a restart 0. The following downloads are for the Scelbi Basic Program from 1974, known as SCELBAL. It was written by Mark Arnold and Nat Wadsworth. M. G. Arnold and N. Wadsworth, SCELBAL: A Higher Level Language for 8008/8080 Systems, Scelbi Computer Consulting (Milford, CT) 1976. When I started this project I searched to see if I could locate an assembler for the 8008. I found AS written by Alfred Arnold. I contacted Alfred about an issue on 8008 support. He was kind enough to even add support for the new instruction mnemonics. I run AS in a Linux environment. AS works great, thank you Alfred! During the development of this project I used the following tools. BS310 BitScope Logic Analyzer and digital Oscilloscope. I LOVE my Bitscope! It’s a 100 Mhz dual trace oscilloscope. An eight bit logic analyzer. And a spectrum analyzer. I run the Bitscope under Windows XP. They offer free schematic and PCB design software. Once you have designed your boards, order them over the Internet. The PCB service is really quick with a two or three day turnaround. The boards can be two or four layer with plated through holes. The schematic capture software is easy to use and has a reasonable parts library. You can add your own custom components. In my setup I write code and burn it into the 2764 EPROM. It is not necessary to use my methodology in building your own computer. You can either deselect the ROM and enter code directly from the front panel, or build a PC interface to load the memory from a printer port. If you do, please share the information back and I’ll post it for others to use. The 8008 has eight restart vectors. They start at memory location 0 and then every eight bytes from there on. It would be possible to design a more complex interrupt handling system where a device, such as a keyboard, would cause the computer to vector to a specific handler. Since my plans are not that complex I’m happy just jamming in a single instruction from the front panel. One point of interest someone may be able to answer for me. Once I’ve started the computer with a restart instruction I am unable to stop it by jamming in a HLT instruction. Interestingly enough, I do see the CPU go into a stopped state, and then continue on. To overcome this I simply program a HLT into the ROM at one of the restart vectors. When I jam in the restart instruction the computer vectors correctly and stops. Any insight on this would be helpful. Unlike modern microprocessors the Intel 8008 lacks a hardware stack that can be used to push and pop data in an ad hoc manner. Tom Pittman designed a solution for the 8008 that uses 6 TTL chips to create a 16 byte stack.